Heather Wardell, Women's Fiction: It's ALIIIIIIVE! And it lost weight! It's ALIIIIIIVE! And it lost weight! Not even in my days as an elementary school teacher, soaking in kids' germs all day long, did I get such a cold. Mr. W thinks I got two colds, one on top of the other, and he might be right. All I know is, the last few weeks are largely a blur. During the worst days, I lost three pounds without even thinking about it. Naturally, they came back. (It's always that way, isn't it?) BUT, over the 9 weeks of my diet/exercise plan, I lost just over 9 pounds. They're gone, baby, and they aren't coming back. I am happy with this, and will continue tracking my food and exercise. That's really all I did... just track and notice. I didn't track every day, but I did most of them and I'm pleased with that. As for writing, poor Aardvark is again on the back burner because I'm going to a one-day writing conference in New York in two weeks and I need to be ready to explain my books in a nice brief fashion. Seriously brief - I will be doing three-minute pitch sessions with agents and editors. If I don't have a plan, it'll sound like... well, like this blog post. And we can't have that! So I'm working on the pitches instead of on Aardvark's second first draft. But I hope to return to Aardvark next week, and if not, definitely right after the conference. I'm nervous about it (agents! editors! New York, to which I have never been! talking for only three minutes!) but I know it'll be fun. I just have to put in the work. Which I shall do. But first, I have to send HUGE compliments to Corrina of Picnicknits for her ridiculously gorgeous yarn. 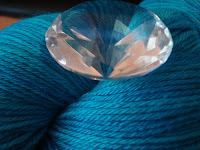 She had a turquoise yarn that she couldn't get a good picture of, and I took a chance on it and it's stunning. I swiped her picture to show you, because my picture of it is even less accurate, but wow, such perfect colours. I liked the picture but it's even prettier in person - not as blue and more a pure turquoise. I love it. I am actually thinking I'll make myself something to wear at the conference for a dose of courage, or take it to make something on the plane. Which is sad, because it's gorgeous too. A rich cobalt blue with hints of lighter blues. May 14, 2009 at 9:13 p.m.
May 19, 2009 at 2:13 p.m.